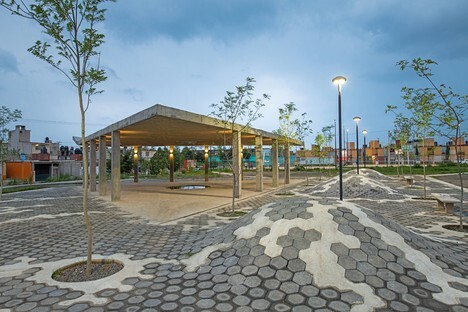 Architect Francisco Pardo has recently designed two urban parks, Parque Colinas del Sol and Parque Los Héroes, to revitalise suburban areas in Mexico. 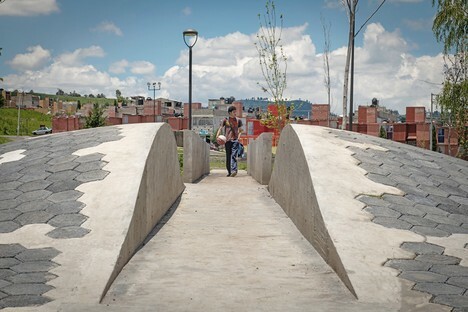 A theme often debated and recalled to the attention even of non-professionals is that architecture can play a fundamental role in programmes to restore or, more properly, to rethink public spaces in order to regenerate degraded city suburbs. 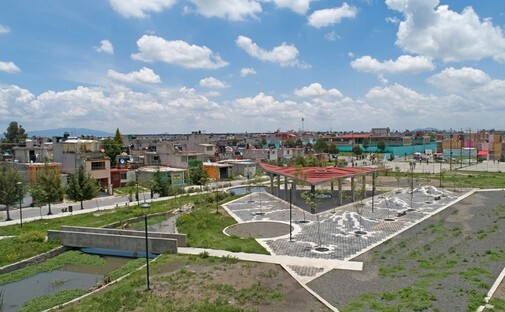 Two interesting examples of this come from Mexico where architect Francisco Pardo was commissioned by INFONAVIT (Instituto del Fondo Nacional de la Vivienda para los Trabajadores) and CIDS (Centro de Investigación para el Desarrollo Sostenible) to design two new parks to revitalise the degraded residential areas of Almoloya de Juárez and Toluca de Lerdo. 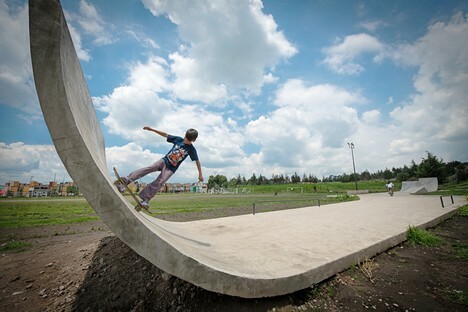 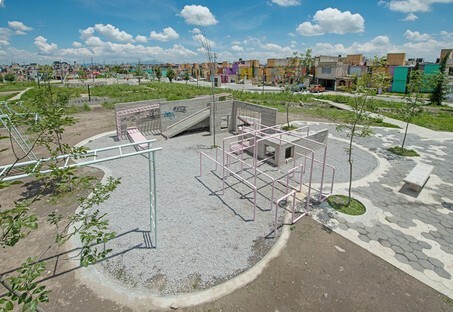 The two parks designed by Francisco Pardo are even more important because they use low cost materials (concrete, steel and blocks of cement) and simple construction techniques that made it possible to involve the whole local community in building them. 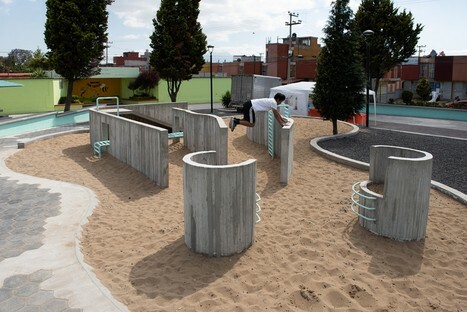 This is an important step in implementing a virtuous circle that mobilised the enthusiasm of local residents and generated a sense of belonging to the multicultural community, as well as taking possession of the public space which was no longer considered a “res nullius” to vandalise, but a shared property to maintain. 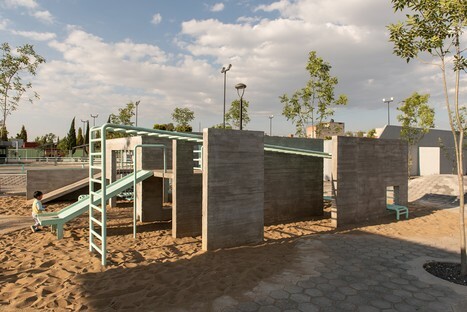 Parque Colinas del Sol is the project to revitalise a system of squares and parks in theUnidad Habitacional de Colinas del Sol in Almoloya de Juárez, Mexico. 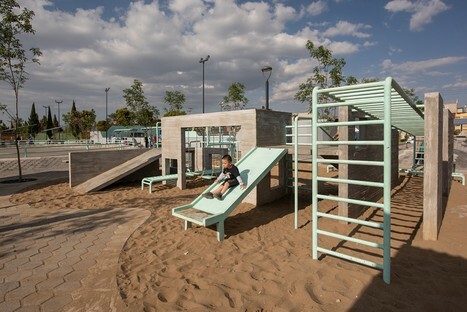 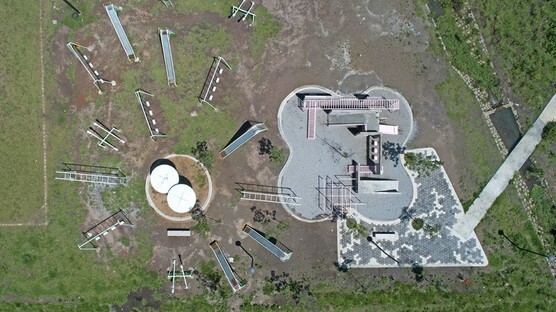 The available site has a surface area of two hectares and has been divided into different themed areas articulated accorded to activity and to the age of their possible users: a children’s play area, a ramp for skating, space for meditation, a football field and a pavilion for public community events. 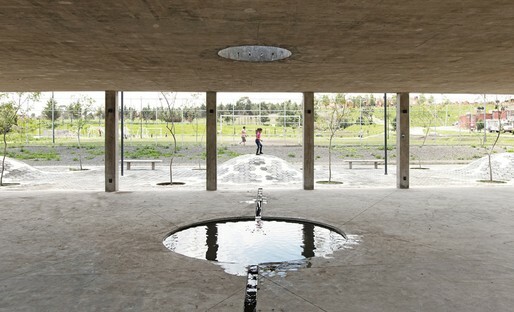 The architect regenerated a water stream to supply a slow drop watering system and to articulate different areas of the park. 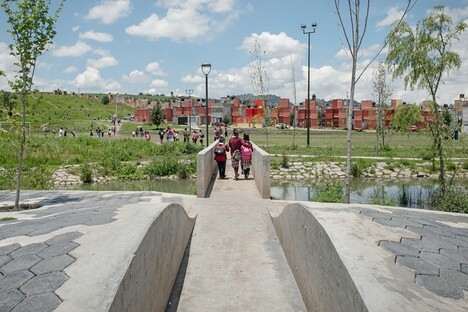 Parque Los Héroes is the new urban park of the Unidad Habitacional de Los Héroes Sección III in the city of Toluca de Lerdo. 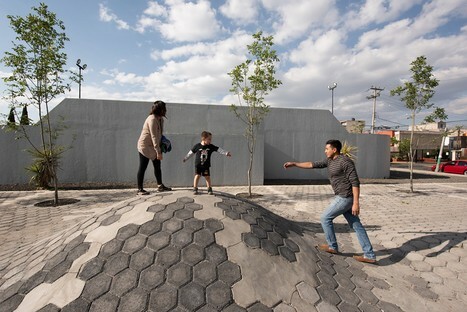 The architect used a hexagonal module to renovate the existing pavement and articulate the spaces for different new activities. 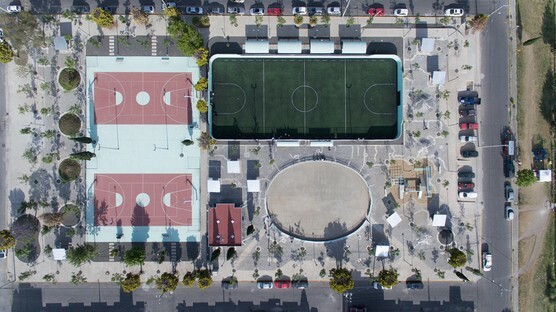 These include a children’s play area, a football pitch and basketball court and a skating rink. 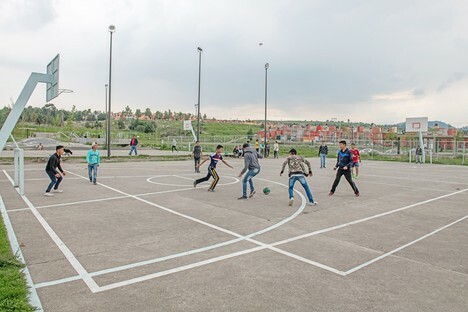 The project was completed by planting new trees along a grid of three metres per side. 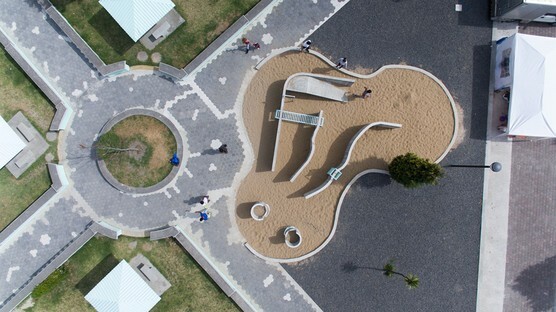 The park is an inclusive space that contributes to improving the quality of life of nearby residential units and a primary school. The two projects share common elements and features of a system that could potentially be repeated to regenerate similar areas. 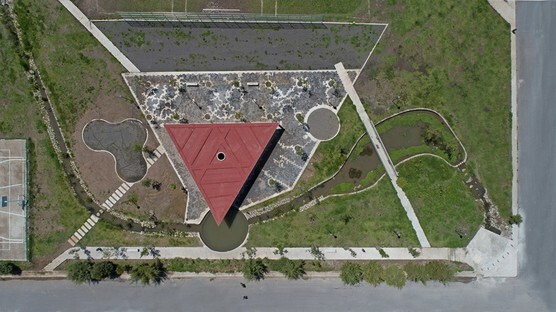 There are two fundamental common elements, the first is the cement block used for the floor and to mark out the topography. 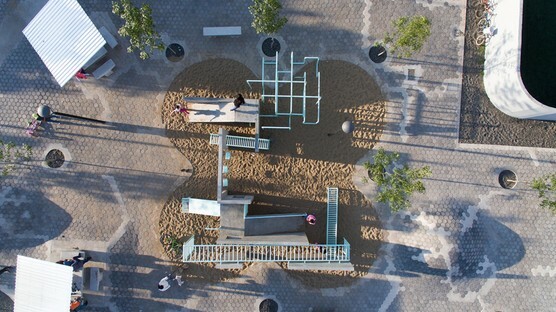 These blockscan be combined in different ways and adapt to specific conditions. 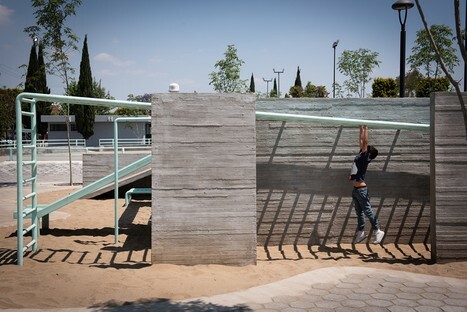 The second element is the play area, a system of concrete walls and metal bars that take on different shapes to adapt to various uses and users.